FX has been making a lot of noise with its marketing campaign for Archer's upcoming Season 7, which has already spoofed the Sports Illustrated Swimsuit Issue and re-created Magnum P.I. 's opening credits. But now, the network's marketing team is quieting things down for the next phase of the campaign: a new PSA urging movie theater audiences to silence their cellphones. 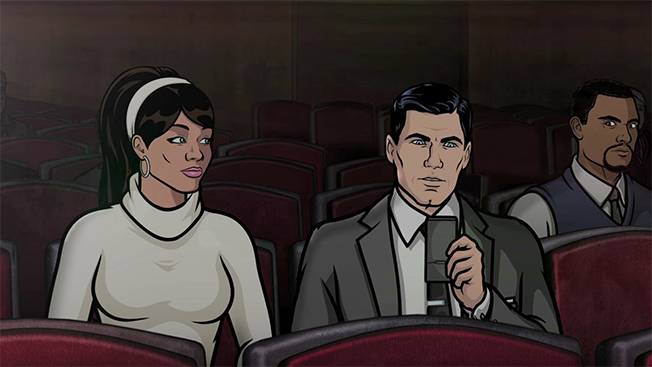 The spot, which will begin airing Friday in Spotlight Cinema Networks' 200 art house venues nationwide, features Archer and Lana, the stars of FX's hit animated comedy. It will run for three weeks, until March 31, the day of Archer's Season 7 premiere. This is the third time Archer's production team, Floyd County Productions, has created a "turn off your cellphone" PSA for Spotlight. "We've done different sequences each year. We change it up and have a whole new setting," said Lance Reiss, svp of marketing for FX. The previous spots were both gold winners in the PromaxBDA Awards' Promos at the Movies category in 2015 and 2013. Last month, the network partnered with Sports Illustrated to feature provocative shots of its female characters in the swimsuit issue and "The Girls of Archer" branded content online. Because Archer is animated, most of the marketing requires close collaboration between Reiss' team and the show's executive producers, Adam Reed and Matt Thompson, who need to incorporate marketing-related animation into the show's production schedule. "Yes, they are extremely busy making a show, but the great thing is I think they're marketers at heart too, because they really respond when we come to them," said Reiss. For example, Reed and Thompson came up with one of the first components of this year's campaign: the shot-for-shot remake of Magnum P.I. 's opening credits featuring the Archer cast. FX posted it in early February to tease Season 7, which finds the former spies moving to L.A. to work as private investigators. "So that's part of a collaboration of, they have an idea, can we make it part of our marketing campaign? Or we have an idea for our marketing campaign, can they help us out with it? That's where it's really become such a dynamic collaboration between the network and the animation studio," said Reiss. "We help motivate each other, and in the end, I think it benefits the show and keeps the show fresh." And there's more to come, said Reiss. "We capitalized on the SI Swimsuit Issue, but there are other key themes and events that are going on in the marketplace—political buzz, spring break—so we decided to take our Archer-esque shot at those as well," he said. To capitalize on the country's fascination/revulsion with Donald Trump's presidential campaign, FX is partnering with Uproxx on a feature—"Who Said It Best: Trump or Archer? "—which will run next week. "It's very timely, and it's perfect in tone with the show, as well as capitalizing on what's happening around us in society," said Reiss, who previously worked with Uproxx last year on branded content featuring "hacked" naked photos from the phone of Archer character Pam Poovey. The network has partnered with the website Total Frat Move to feature a photo submission contest centered around spring break, and Pam Poovey's 10 tips for spring break. "It's all done in her unique voice and tone. So you can imagine, not safe for work at times, and maybe not safe for the children," said Reiss. Additionally, Complex will feature a video series, launching March 23, in which Sterling Archer discusses five drinks that every man should know how to make. The network's social team is hard at work on posts featuring the Archer characters at famous L.A. landmarks, including TCL Chinese Theatre and Venice Beach, plus "Lana with her baby courtside at a Lakers game," said Reiss. They are also creating '70s-era postcards, hiding the characters in photos of landmarks like the Hollywood sign, Santa Monica Pier and Griffith Observatory. "We have a lot of fun" with the Archer campaigns, said Reiss. "These are the things that drive us continually to keep the show and campaign feeling fresh."